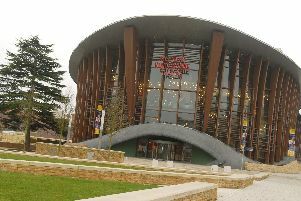 Two spectacular musicals are part of the autumn line up at the Waterside Theatre in Aylesbury. The irresistible feelgood comedy Hairspray (pictured above), based on the hit movie starring John Travolta, promises to leave theatre goers feeling great in September. Set in 1962 Baltimore it tells the story of Tracy Turnblad, a big girl with big hair and an even bigger heart, who wants to dance her way onto national television. Featuring hit songs including You Can’t Stop The Beat it’s sure to have audiences on their feet by the end of the night. In November, Joanne Clifton stars in Flashdance the Musical alongside Ben Adams from A1. This tells the story of Alex, a welder who dreams of becoming a professional dancer. And we can expect some spectacular dance moves from Joanne, who won Strictly Come Dancing last year, especially when it comes to the iconic final scene with What A Feeling. In September former EastEnders stars Paul Bradley and Jessie Wallace star in Deathtrap, a thriller about a successful writer in the grip of chronic writer’s block. Two shows for the children include The Tiger Who Came To Tea in September and Peppa Pig’s Adventure in November. All or Nothing, a musical based on the life and music of the Small Faces, visits in October and at the end of that month The Railway Children, currently on tour at many of the theatres in our region, visits the Waterside. One night shows include many tribute acts paying homage to some of the biggest stars in the world of entertainment including Islands In The Stream (Dolly Parton and Kenny Rogers), Thank Abba For The Music, One Night of Elvis, Whitney - Queen of the Night and The Illegal Eagles. Original artists are also visiting in the shape of Alison Moyet, Elkie Brooks and Roy Wood. And comedy stars include John Bishop, Rob Brydon, Jasper Carrott, Milton Jones and La Voix.